It’s easy to identify with Ravnica’s guilds. The plane owes much of its popularity to that simple fact. In Modern, where color fixing is better than any other constructed format, players have more often aligned themselves with shards or wedges, such as Jund and Jeskai. But these days, decks tend to be defined less by their colors than by their engines or synergies. Today, as we nostalgically await the first spoilers for Guilds of Ravnica‘s follow-up expansion, we’ll harken back to a simpler time. A time when Modern players readily associated with a shard or a guild. A time when midrange decks sharing names with such factions were actually good. Stumbling upon a recent forum post inspired me to reconsider my previous stance on midrange in Modern (that it’s not dead). Especially since the rise of Arclight Phoenix, midrange decks—here defined as aggro-control hybrids that disrupt opponents, then commit threats to the board—seem to have tapered off, despite occasional (innovative) showings in 5-0 dumps. In this section, we’ll enumerate the three chief failings of midrange. 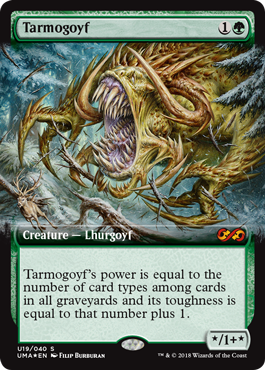 Tarmogoyf once stood tall as the strongest creature in Modern by a mile, as well as the most-played. Not coincidentally, midrange decks contracting the monster dominated Modern for years, challenged primarily by now-banned decks. Eldrazi creatures were the first to rival Goyf’s red-zone efficiency, and Fatal Push further jostled the Lhurgoyf’s standing among combat creatures. Since then, a plethora of creatures have been printed or enabled that do more than just brawl (Spell Queller, Thing in the Ice), or that trump Goyf on mana efficiency (Hollow One, Arclight Phoenix). Midrange decks have largely failed to take advantage of such creatures as aggro decks have. The two exceptions are Death’s Shadow, which is both cheaper and frequently huger than big brother Goyf, and Bedlam Reveler, whose cannibalistic graveyard reliance further ostracizes the fallen king. As their employable threats became weaker relative to Modern’s, midrange decks plummeted in stock. Between Fatal Push, Thoughtseize, Collective Brutality, Assassin’s Trophy, and others, midrange decks enjoy an embarrassment of riches when it comes to disruption. What they don’t enjoy is finding each answer at the right time, a task exceedingly daunting in a format notorious for banning in-game consistency tools. 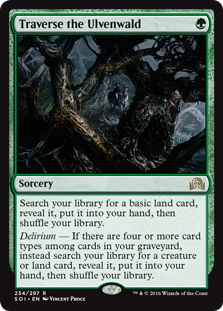 Available options are limited: Grim Flayer (a squishier, less-splashable Tarmogoyf); Traverse the Ulvenwald (I, too, lose to Rest in Peace); Serum Visions (enjoy your durdle); Ancient Stirrings (kiss most of your core goodbye); and Faithless Looting (welcome to red, and to minus-ones). The latter three see plenty of play, but only Looting helms a midrange deck: Mardu Pyromancer. And even still, results indicate the card is more at home in aggro-combo. At the end of the day, existing consistency tools are far better at finding (and accelerating into) threats than they are answers. 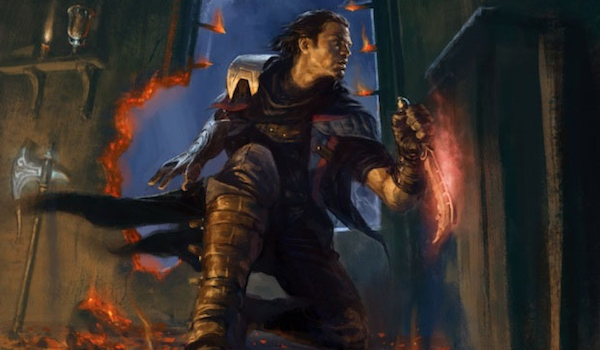 It stands to reason that midrange decks have much to gain from ditching their slower elements and embracing aggression. The consistency issue is exacerbated by midrange’s innately high land count, which makes it prone to flooding in the mid-game; upping aggression helps on this front, as well. Tarmogoyf; Grim Flayer. Heck, Bedlam Reveler. Lingering Souls! What do all these staple midrange threats have in common? They rely on the graveyard. In a format where the top-performing decks are aggro-combo strategies that also rely on the graveyard, this predicament opens midrange up to splash hate from just about everyone. Buff threats that resist graveyard hate form yet another missing piece of midrange’s Modern puzzle. Can midrange reclaim Tier 1 status in Modern? I decided to uncover the true limitations of aggro-control’s slower breeds with a unique deckbuilding exercise. The top-down approach I utilized involves addressing midrange’s issues out of the gate, and filling out the list next. Best generic card selection spell in Modern? Faithless Looting. Best generic disruption spell in Modern? Lightning Bolt. A way to close out the game. I wanted my threats impervious enough to Modern’s current hosers that they could tangle with the velocity decks on a resilience metric, but still proactive enough to close out games against the combo decks. A way to monetize Faithless Looting. An inherent minus-one, Looting is mostly worth it when it breaks even (or goes up) on card economy. To decide which guild (or even shard/wedge) I’d align with, I scrutinized what each color brought to the table in terms of threats, utility, and disruption. Many options already exist in red, and we are seeing some contemporary Looting/Bolt decks neglect to splash altogether. Swiftspear is best supported alongside a cast of burn spells, and with his buddy Soul-Scar Mage. That direction already pulls us deeper into aggro-combo than aggro-control, and the same goes for Runaway Steam-Kin; these are not creatures meant to take over a game after opponents have been destabilized. Young Pyromancer shines with targeted discard to ensure his fragile body sticks around and provide some quick bursts of value after resolving, so it’s more of a black threat in this shell. That leaves Arclight and Bedlam, the red threats seeing the most play beside Looting/Bolt. These threats compliment each other frighteningly well, occupying suitably distinct spots on the strategic curve and attacking opponents from myriad angles (Arclight flies, hastes, and recurs; Reveler walls, swells, and refills). Aggro-control decks wielding both already exist, dipping into blue for extra cantrips and Thing in the Ice. But those decks trend more tempo than midrange, and also toe the aggro-combo line, making them unrecognizable as rock decks. They’re closer in spirit to thresh, and even more to grow, especially the Grow-a-Tog decks of Vintage past. Color takeaways: As the available options push us into tempo and aggro-combo, we’ll have to look outside of red to build our midrange deck. The uninhibited guild of creative freedom, Izzet indeed offers our eight-card core multiple considerations. Delver, again, is too low on the curve to serve a midrange deck. 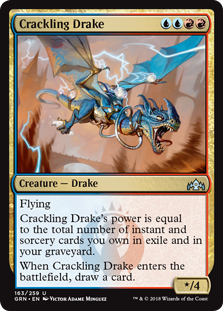 Conversely, Crackling Drake is quite high, but I think one of the more appealing options as a closer; it’s a one-to-three-turn clock, difficult to remove, and critically self-replacing in sloggy pseudo-mirrors. The threat that synergizes best with Bolt and Looting, though, is Thing in the Ice. Thing performs multiple functions at once: pilots don’t need to dedicate too many slots to removal, as it handles entire boards of creatures by itself; they also don’t need to load up on aggression, since Thing hits like a truck. As such, Thing proves exquisitely compact, letting players fill out their decks with cards that bring it from viable to insane. A shell full of cantrips and Manamorphose is not only poised to make exceptional use of Arclight/Reveler, but threatens to flip Thing in the Ice on turn three with pinpoint accuracy, significantly improving Izzet’s proactive capabilities. If all that wasn’t enough, Thing supports Arclight/Reveler by evading graveyard hate itself. Sound great? It is. But midrange it ain’t. Beyond threats, blue offers our deck additional cantrips and countermagic, not that we need to indulge it if we’re fast enough. Guild takeaways: As with mono-red, we won’t have much success building midrange in these colors. The reckless guild of ruin, Rakdos has little regard for anything but its own goals. Ironically, this splash offers us blue-chip interaction. Death’s Shadow heavily taxes our life count and shoves us towards aggro-combo with Temur Battle Rage, although the card already enjoys minor success in the rock shell of Traverse Shadow. Tasigur and Angler are relatively unimpressive in Modern right now, being outpaced by the faster aggro decks and suffering from splash damage aimed at those same decks. As mentioned above, Young Pyromancer is an intriguing option given this splash, but we’d have to take care not to build a worse Mardu Pyromancer. While these walkers have their uses in certain matchups, I’ve come to believe that both of them are too specific for successful mainboard use outside of currently-underperforming strategies (i.e. Jund), and only Last Hope is impactful enough for the side. Their steep color requirements also hurt. These cards all represent the most universal ways to disrupt opponents before committing pressure to the board, making them perfect for midrange decks. Guild takeaways: Black’s superb disruption could assist us, but we’d still be lacking pressure. Going the Mardu route with Reveler/Souls just opens us to splash graveyard hate. Fusing colors of transparency, honor, and impulse, Boros is perhaps Ravinca’s most patriotic guild (oh, Canada!). White’s never been known for its aggressive elements, but it offers us the most devastating sideboard cards… assuming we’re not soft to them ourselves. Path gives us a Push-esque way to remove troublesome creatures, and is doubly effective at sniping recursive threats like Phoenix. The real draw to this disruption suite, though, is Rest in Peace, which pundits are (correctly) claiming is now useful enough to merit mainboard play. Hosing artifact-based aggro-combo and pure combo alike, Stony Silence is also receiving the red carpet treatment from content producers. Guild takeaways: We’d go Boros for the hosers, forcing our strategy to at once mitigate the damage from Rest in Peace and extract value from Looting. A tall order! Gruul is the instinctual guild of bodybuilding—muscle and dorks. But Goyf ain’t the Mr. Universe he used to be. I stood by the Big Man after Fatal Push, but the new wave of aggro-combo decks and their demand for graveyard hate have all but antiquated this beater. In other words, exactly the kind of clunk that bogs down today’s attempts at midrange, and a tutor to find them with. Guild takeaways: In my eyes, green is no longer a discard spell’s best friend. Goyf’s is the color of sweeper-soft creature-combo. As I defeatedly stared at my completed list of red guilds and their respective benefits, I realized one faction was missing, just as it is from Ravnica. Before aggro-combo’s resurgence, the Eldrazi provided the first true alternative to Goyf’s bulk in a disrupt-then-commit aggro strategy. Look at that—an entire curve! So much for treading water until we find our single acceptable threat in a given color. The bigger creatures make a unit of Mimic when we need pressure, and out-Goyf the Lhurgoyf when we don’t. Scourge also allows for some neat tricks, as we know. 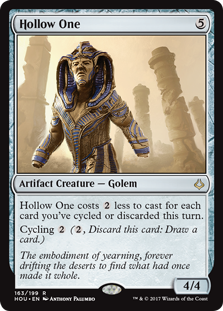 The above catalog includes one non-Eldrazi colorless creature: Hollow One. Hollow works with Faithless Looting, but requests a little more discard to be reliable; the proven loot effects, Burning Inquiry and Goblin Lore, tend to be too random in their discards to excel in a midrange deck. Not so with Street Wraith, which rewards a fetchless manabase and perhaps enables One when combined with Looting alone. The Golem also has tickling explosiveness applications with Eldrazi Mimic. Color(less) takeaways: Running Eldrazi necessitates Eldrazi Temple, and subsequently does a number on our mana. Conveniently, the tribe avoids many common hate cards, and can even run them itself. What can I say? I’m a meathead. Here’s where I landed. There are a few interesting things going on in this list, so I’ll address each of those in their own section. We were already in Looting, so Hollow wasn’t so hard to accommodate. I started without this package, but found myself too slow to adequately pressure aggro-combo without Chalice of the Void to disrupt them. Of course, Looting and Bolt prevent us from using Chalice, so our other option was to seize some speed ourselves. Smuggler’s Copter too helps cast Hollow One. No Chalice here. Not even a Blood Moon. But just as Street Wraith supports Looting as a necessary evil for Hollow One, so does Guide support Temple for casting Eldrazi. Our creatures are solid, but they are slow, or at least slower than most of what Modern’s doing right now. We need them to resolve early enough to win us the game. We can also just tap three lands for Guide and get our Grey Ogre on. The first draft got value out of Eternal Scourge with 4 Serum Powder. It was better at finding Temple, too, but disjointed overall; it stretched hands featuring both Eldrazi and Hollow elements precariously thin. As a midrange deck, I found myself wanting to keep many slower hands that included Powder, and eventually cut the artifact. Now, I’ve taken Riley Knight’s would-be advice and moved 2 Rest in Peace from side to main. Not only do they fulfill their literal purpose as hosers and free-win generators, they allow us to extract value out of both Scourge and Faithless Looting without fearing graveyard hate. Achievement unlocked! We simply discard Scourge to Looting or Copter, and a resolved Rest in Peace functionally draws them again. Rest’s continuous effect on the battlefield also offsets the loss of Looting’s back end, since when Scourge dies, it automatically rejoins our pool of castables. And when Rest is really bad, we can just Loot it away. We’re mostly a red Eldrazi deck, so our white sources are limited. I’d add more if we had better options available (Battlefield Forge 5-8), and may trim a Mutavault for the fourth Sacred Foundry. Vault is the best utility land (besides Zhalfirin Void) in Colorless Eldrazi Stompy right now, but between Looting flashback, pricey Hollows, and Sourge/Rest, we have lots to do with our mana already. Ramunap Ruins is incredible. I had to see it in action to believe it, but the card has already won me multiple games. Blood Moon: Tampers too much with our mana, especially without Powder. Also a bit slow. Rest in Peace is the superior lock piece here. Thalia, Guaridan of Thraben: A possible sideboard include, but we’ve got no space in the main. Eldrazi Displacer: Incredibly slow. We already win the value game with Scourge. Eldrazi Obligator: Also slow, and useless against a large portion of decks. Gone are the days of Goyfs and Gurmags. No way can we fit this guy. Dismember: I think Bolt is enough removal for the main, and enjoy having so much reach in an aggro deck. Zhalfirin Void: Not impactful enough at 2 copies, which is all the space we have. There’s also less chaff to sort through without Powder in the deck. Rest in Peace: We want multiple copies against the decks we bring it in against, since they aggressively mulligan into answers for it. Damping Sphere: Improves in multiples, and is one of the most effective ways to attack velocity-based decks. Also helps vs. Tron. Abrade: An all-star in the Hollow One mirror, and fine against most creature decks. Dismember: Mostly a concession to Thing in the Ice, which can be forever-blocked by Scourge/Rest but is very annoying combined with reach. Anger of the Gods: The sweeper effect Colorless has always wanted. RR is accessible with this manabase and 4 Guide, and we don’t play Matter Reshaper. Is Boros Eldrazi Stompy better than Colorless Eldrazi Stompy? Probably not. It’s certainly not as finely tuned. But I think the principles applied in its creation might help some more dedicated souls elevate midrange to its former heights. Until then, may you race with valor—and, no matter which free creatures you elect to dump into play, never forget who you are. However, later during the testings, the deck felt way more unstable. It had some sometimes issues to find a good mix of threats or answers, even with looting, but usually that was fine. The main issue was concerning the manabase : the land count often felt too low to cast the bigger spells, even with looting, and the white sources were often missing. The deck felt terrible against Blood Moon as well. Still, when I could find the hate cards, combined with the fast clock, they definitely proved to be gamebreaker… but only with a white source. So, moving forward, I would most likely consider adding a few lands for consistency, which we can just discard to looting if needed, and it would most likely be some fetchlands with maybe even a basic plains to fetch for if we fear Blood Moon of if one of our few white sources is removed by FoR or GQ. I definitely tend to favor land-light builds! Even with 1-2 more lands, the deck will have consistency issues — you can’t always draw Looting. But I’d wager that it (and other Looting-fueld midrange decks) would still have fewer of these issues than, say, Jund. We already run a Plains, but I can see fetchlands being fine here. Agreed, my experience with Eldrazi suggests that 20 lands is at least three too few. I’m currently playing UW Spirits with 20 lands and it feels borderline even with four Vials and an average CMC of ~1.85. And the first thing I thought when I looked at the list was “No Serum Powder? You’re dead to Blood Moon!” Serum Powder is a fun card, but not a very good one, and its corner-case value against Moon in a colorless-matters deck is one if ist prime selling points. I’ve applied the Turbo Xerox rule to this shell. For every two one-mana cantrips, we should be able to shave a land. This deck plays four zero-mana cantrips (even better), as well as four one-mana cantrips that are particularly adept at finding lands early and ditching uncastables. On top of that, four of our lands tap for two mana, and four of our creatures benefit from built-in cost reduction that can lower their CMC to zero.